Do you dream of leading the Indian march past at Olympic ? Do you think that this dream wont ever come true because you are not an athlete ? You are wrong. A lady from Bangaluru has just made it possible at the 2012 Olympic opening ceremony in London. She is Madhura Honey alias Madhura Nagendra. Acting chef de mission of the Indian contingent Brig P.K. Muralidharan Raja has said "We were initially told that she would accompany the contingent till the track but she went on to take the entire lap. There was another man also but he stayed back and did not enter the stadium.... We have taken strong exception to this. The march past is for the athletes and officials attached to the contingent. We are totally taken by surprise how a person could just intrude into the track." Madhura Nagendra, a post graduate of Christ College in Bangaluru, who is living in London, showed her Olympic passes on Facebook before she appear in the world media. 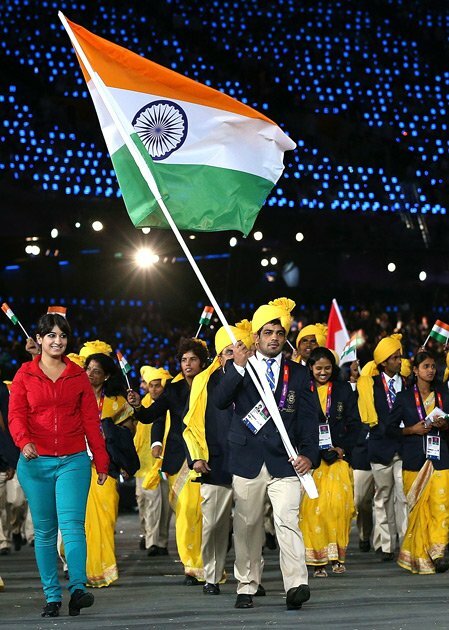 She walked confidently in red & blue along with wrestler Sushil Kumar, who was bearing the national flag of India !!! Her father K. Nagendra said in an interview "My daughter Madhura was officially selected for giving a dance performance in the inaugural ceremony by show creator Danny Boyle... From whatever I learnt and presume that she being an Indian, the London Olympics Organising Committee might also have selected her to 'take' the team inside the stadium. This might have hurt our team's feelings. I feel very sorry for that."